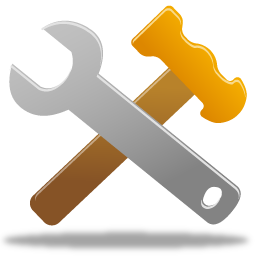 On Friday October 18 at 9 pm PST we will be performing maintenance on the server that Wildlife Rehabilitation MD is hosted on. This maintenance is being performed to improve the security and identity of Wildlife Rehabilitation MD. Users should avoid using Wildlife Rehabilitation MD between Friday October 18 at 9 pm and Friday October 18 at 9:30 pm PST or you may experience odd behaviors from the site. Wildlife Rehabilitation MD has many ways to extend it’s program. We sometimes add new extensions from our users great ideas. In order to publicize these extensions we are going to start promoting an Extension of the Month. Every month we are going to spotlight an extension and discuss it. If you are unfamiliar with our extensions or how to use them, go watch the Extending Wildlife Rehabilitation MD Tutorial video. It seems only natural for this months extension to be Quick Admit. In order to get all of this years records in by the end of the year, this extension will make it quicker and less painful. 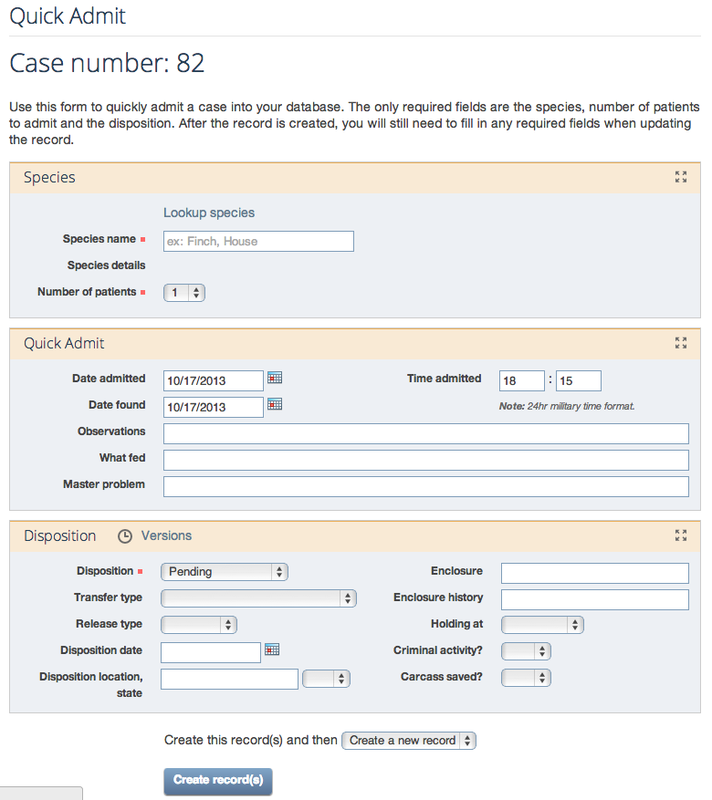 Use this extension to quickly admit a case into your database. The only required fields are the species, number of patients to admit and the disposition. After the record is created, you will still need to fill in any required fields when updating the record. After activating this extension a link titled “Quick Admit” can be found at the top of the New Record screen. Once on the Quick Admit screen you will see a much smaller version of the New Record form. Use this new form to quickly add records to your database. You must identify the species and the number of individuals that are being admitted. By default the current date and time will be used as the date admitted and date found. You may adjust these as needed. You may optionally fill in the Observations and What fed fields as needed. Note: If you are in a really big hurry and need to create a record pronto, then you can simply go to the Quick Admit screen and immediately press Create Record(s). This will create one record with a species of unknown and set the date admitted and date found to the current date. Then, at a time that is more convenient to you, you can update the species and dates as needed. The Wild Neighbors Database Project team will be presenting Wildlife Rehabilitation MD at this years International Wildlife Rehabilitators Council (IWRC) Symposium. 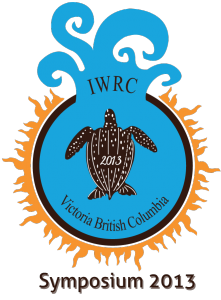 The symposium is at the Delta Victoria Ocean Pointe Resort and Spa in Victoria, BC on November 4th – 9th. Our presentation will be on November 8 at 4pm. Sign up soon to see us there! 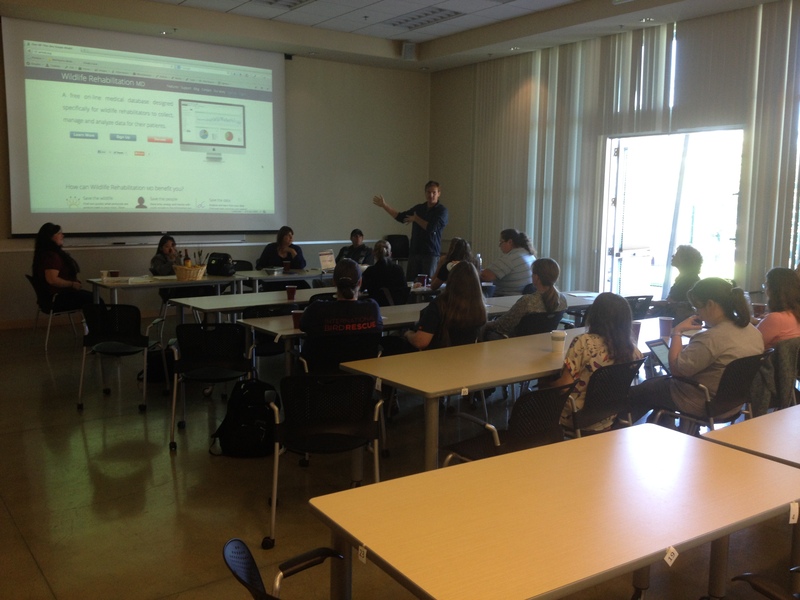 On Friday, October 4th we attended a Region 3, local groups meeting hosted by Wildlife Center of Silicon Valley (One of our most active accounts). Most of the people at the meeting already knew about Wildlife Rehabilitation MD or were currently using it at their facility. There was no need for us to go over the basics with this group so we discussed the most current updates and had discussions of new features to come. One of the topics that we needed advice about was how they, the user, would like to transfer records between WRMD accounts. It was a great discussion that we could only get from a group like this. One of the features that we are going to create is a easy way to transfer records amongst facilities using WRMD. We want to create a way that accounts can transfer records directly from their account to another. With this groups help, we were able to learn how a feature like this would work best for them. If you have any questions or ideas about this feature please email us at [email protected]. On October 1, 2013 we had a training at the Monterey CA SPCA to help their staff and volunteers become familiar with Wildlife Rehabilitation MD. This video is raw and unpolished so that you can also follow along with the questions and conversations.